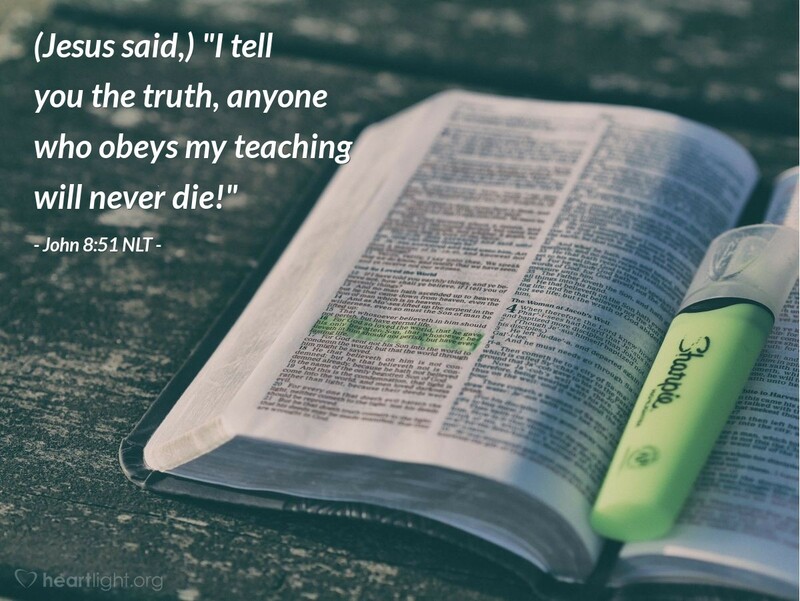 [Jesus said,] "I tell you the truth, anyone who obeys my teaching will never die!" When we become Christians, when we are baptized into Christ, we die to our old selves. We are raised to live a new life. The old life is gone. The most important death has happened. Yes, our bodies will eventually die. But as Christians, we are united with Christ and not even physical death can separate us from him. The living part of us goes to be with Jesus and awaits his triumphant return to earth in glory when all that belong to him are changed and given immortal bodies and go to live with him forever. When we obey him, when we belong to him, death cannot claim the living part of us. We will never die but will live with the Lord forever. As Paul says in 1 Thessalonians 4:18, we should encourage one another with this message! Almighty and eternal God, my Abba Father, thank you for making me yours and joining my life to Jesus so that death can claim only my body, but can never have me. I look forward to the coming day of victory when I will join with all of your children to celebrate and participate in your glory! In Jesus' name and by his power, I praise you. Amen.